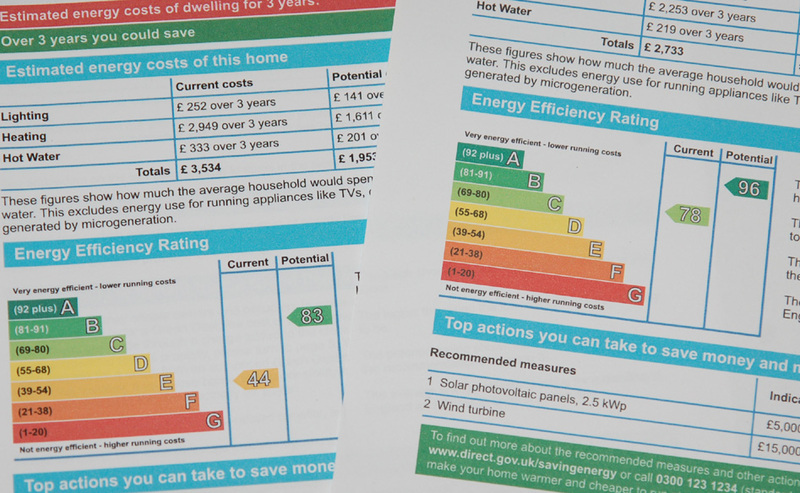 It was with some trepidation recently when Neil from the Severn Wye Energy Agency came round to assess The Secret Acre’s new Energy Performance Certificate (EPC). This was after all the independent validation of our smallholding’s whole eco-makeover! When we found The Secret Acre in 2013 its EPC stood at a lowly score of 44 (in band E). To put this in context, EPC scores run from 1 to 100, with 75% of the poorly insulated UK housing stock shamefully lurking in the lowest D to G bands scoring just 1 to 68. So even by UK standards, The Secret Acre was not in great shape. But there was reason to be hopeful. That 2013 EPC said there was the potential to get to the lofty heights of 83 in band B with full insulation (loft, wall and floor), PV and a wind turbine. Could we really hit that target? Only 1 in 100 homes makes that mark, and it is virtually impossible to score the 92+ needed for band A unless you are building to passive house standards. When Neil’s results came back, thanks to our obsession with insulation, The Secret Acre had nearly doubled its lowly rating to an impressive 78 at the top of band C, and will outperform the original EPC projection hitting B83 next year once our PV is installed. And although we don’t have the money to invest in a wind turbine, if we did The Secret Acre would reach A96! So not a bad result, moving the property from well below the national average into the top 1% of UK homes, an investment we will be very pleased every time we get our low energy bills over the next ten years! This entry was posted in Good Life, House and tagged eco makeover, energy efficiency, energy performance certificate, EPC, floor insulation, home insulation, insulation, loft insulation, Paul Rainger, PV, Severn Wye Energy Agency, Smallholding, solar thermal, solid wall insulation, The Secret Acre, wind turbine by paulrainger. Bookmark the permalink.